M.Mgt, BA, FSB, FTCL, FSCA, ANZIM, CLTA, Dip.Bus.Admin, Dip ATE. Meredith has been Principal Consultant of her own Consultancy for over 40 years. She is a Registered Speech Teacher formerly lecturing at the Auckland University of Technology where she specialised in Business Communication. 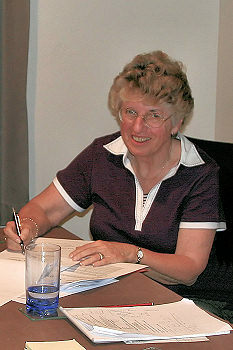 During the 1990s Meredith taught spoken English to classes of new immigrants at Auckland University. She also taught presentational speaking at Massey University and St John's Theological College. She is a Trustee of Speech New Zealand and an examiner travelling throughout New Zealand. When Meredith established her Consultancy she worked with students from the age of 4 years as that is when language skills become so evident. Over the years she has specialised in the development of these skills throughout a child’s development into adulthood. Her particular interest now is the training and preparation of those in the corporate workforce, enabling them to share their knowledge and expertise both within New Zealand and offshore. "Public speaking is something we are sometimes thrust into reluctantly, whilst pursuing something we are passionate about. My work in conservation has moved me into a number of leadership and advocacy roles which have made me consider how I perform when speaking in public. Meredith helped me gain confidence in this area, encouraged me not to read from an A4 page, but to speak freely from notes. I especially valued the audio/video feedback and Meredith’s obvious expertise in speech". Chair, Forest & Bird North Shore Branch. "My confidence in presentations and impromptu situations has increased noticeably since learning with Meredith. This has been vital to my career in public relations, s my improved self confidence has in turn enhanced my leadership skills. Furthermore, I have been given tools to better my listening skills and report analysis, which are both vital to successful client relations." "When running a business in Auckland, one of the challenges is communication with prospective clients in English which is my second language. As we all know, writing and speaking are the ways in which a business person like me manages customers, staff and promotes products/services. In coping with the growth of business, I realise that an experienced communication specialist is essential to help overcome the communication barrier. Fortunately, I found the communication specialist, Meredith Caisley, who not only corrected my English but more importantly, lifted my awareness of communication efficiency. In other words she showed me the perception of the receiver of my communication and what they would understand from my conversation with them. Meredith also focused on and improved my pronunciation a lot. She added to my engineering skills by enabling me to change from speaking effectively in Mandarin to communicating in English. It did not happen overnight but given time, we made sure progress. This was all thanks to Meredith’s patience, discipline and encouragement". "I studied at the Caisley Communication Consultancy for several years, sitting public speaking exams from Grade 6 to Associate Diploma level. It was the superb training I received from Meredith that led me to the path I am on today, working as a consultant for UN Women, the United Nations agency for women’s rights, first at Headquarters in New York and now at our regional office in Bangkok, Thailand. It has always been my dream to build a human rights career, and I never expected when I started my speech lessons, that the Studio would lead me to this. I still remember being 15 years old and presenting an impromptu speech about the United Nations to Meredith on our first lesson. From then on Meredith nurtured my skills and helped me grow in confidence. I am convinced that it was my public speaking training that opened the door to my UN career, highlights of which so far have been delivering a presentation at an international meeting in Europe (where I was the youngest speaker by several years), drafting press kits and communication materials, and now coordinating two conferences in South-East Asia in my new Bangkok-based role. I think of Meredith not just as my teacher but my mentor. I cannot recommend Caisley Communication Consultancy enough, and I know now, as I continue with my career, that the training I received was world class. " "I attended private lessons with Meredith as I lacked confidence, and an understanding of the structure of public speaking and speeches. I felt this lack of knowledge was holding me back personally and professionally. I found Meredith to have a wealth of knowledge and skill in this field which has been an immense help to me. Meredith also is very approachable, and a great conversationalist. I was always looking forward to the next lesson, and hope to have more lessons in the near future. " During my secondary school years I represented my school in debating and oratory competitions to a senior level. Outside of school I competed successfully in a number of speech and drama competitions. I have very much enjoyed my weekly lessons with Meredith. Every year I learned different aspects of speech and drama performance and theory. Already my years of training have proved invaluable to me and will continue as I embark on a conjoint Law and Arts degree at Auckland University to prepare me for a career in the field of human rights. I am also leaving my time with Meredith with two well-respected diplomas for my Curriculum Vitae."